Anyone who went to see Stephen Spielberg’s masterpiece, Jurassic Park, in 1993 will never forget the sight. Moviegoer’s jaws dropped at the sight of that first Brachiosaur as it walked past the cast. The T-Rex’s first appearance is one of the greatest moments in film history! The Jurassic Park franchise was something special, like out of every kid’s dream come true. After Jurassic Park III, the franchise went dormant for twelve years. Then, it was reborn in a 2015 sequel/soft reboot with the park opening. Then they made that giant mutant raptor, and the park closed. Either way, this was a big deal. Since LEGO likes big deals, they released a Jurassic World theme in 2015 and 2018, to coincide with the Jurassic World movies. 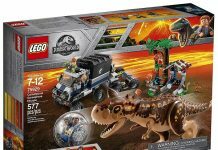 The LEGO sets are from Jurassic World and the Fallen Kingdom movies, with one being based on the original Jurassic Park. Fun Fact: Did you know that the T. Rex that originally featured in the Jurassic Park movie is the same that features in Jurassic World? !